Rhinoplasty is a procedure for altering the structure, improving the function, and aesthetically enhancing the nose. Currently, the most common method of achieving this is with a surgical rhinoplasty. 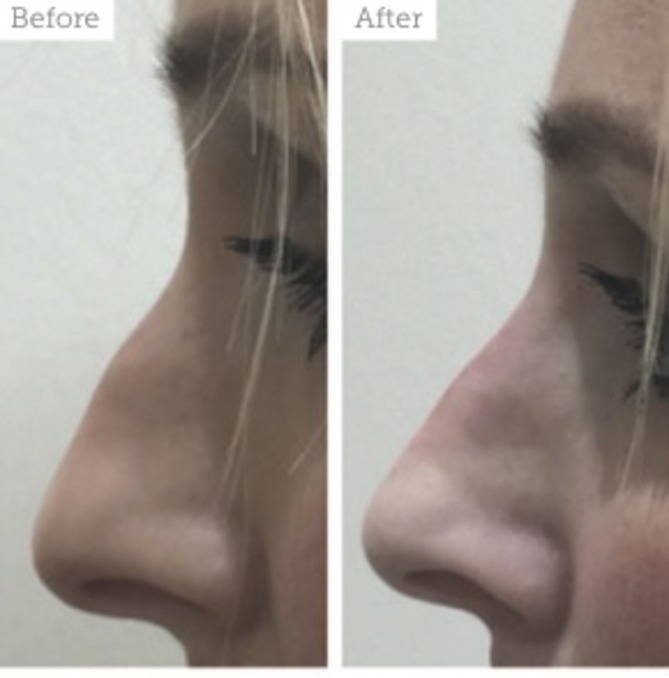 This article discusses a developing method of altering the shape of the nose non-surgically and provides anatomical advice for practitioners looking to incorporate this treatment into their clinic. Three groups of patients are suitable for consideration of injection rhinoplasty. These include those with small deformities that can easily be addressed in the clinic; patients who have defects that would benefit from formal rhinoplasty but are not ready to commit to a surgical procedure; and finally, post-rhinoplasty patients who can have an injection procedure to smooth out any residual roughness or depressions. The biodegradability of HAs allows them to be used as a pre-surgical treatment to enable a patient to visualise the result prior to proceeding to surgery. This is a useful tool for patients who may benefit from surgery, but are not quite ready to take the step. The cost of HAs is considerably less than the cost of surgery, allowing treatment for the more budget- conscious patients. 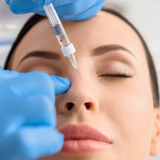 As HAs can be injected with either no anaethesia, or simple topical anaesthesia, the procedures can be carried out quickly and safely in a clinic environment. As bleeding and bruising is minimal, the downtime is negligible. The duration of action is from 12 to 18 months, whereas some patients may request longer-lasting results. While HAs can be used to camouflage defects, they cannot correct structural anatomical abnormalities. When assessing the nasal deformity it is important to understand the underlying anatomy of the area in order to appreciate the effect the alteration may have on the function of the nose, as well as to appreciate the mechanism of potential complications. The nasal muscle lies deep to the skin and comprises the procerus muscle, which arises from the fascia overlying the inferior part of the nasal bones, and inserts to the skin between the eyebrows. The procerus muscle assists in pulling the eyebrows downwards in the frown or anger gesture. Prolonged use of procerus is causative of a horizontal rhytid forming over the upper- third of the nose.8 Levator labii superioris alaeque nasi runs laterally along the nose, attaching to the frontal process of the maxilla superiorly, and inserting into the skin of the nostril inferiorly. It is responsible for flaring of the nostrils as well as assisting with lip elevation. The other muscles are depressor septi nasi, the transverse nasalis and the dilator nares. Depressor septi nasi inserts into the skin in the upper lip, and is responsible for the ‘dancing’ nasal tip that is occasionally an aesthetic concern. Transverse nasalis compresses the nares and dilator nares, which dilates the nares. The muscles are all contained within the submucosal musculoaponeurotic system. Injection of HAs into the nasion area can correct volume depletion and camouflage a pseudo-depression caused by an osteocartilagenous dorsal hump. By increasing the profile and volume of the nasion area the base can appear narrowed, as loose deflated skin gets re-draped. It can also affect the horizontal rhytids caused by contraction of the procerus, as well as the nasal scrunch lines caused by contraction of nasalis and the medial fibres of obicularis oculi. I tend to use topical anaesthetic or no anaesthetic at all, depending on patient preference. Local infiltrations make the correction harder to judge as a result of their own volumising effect. In addition, the combination of supratrochlear and infraorbital nerve blocks can provide good regional anaesthesia, however, they can be uncomfortable for many patients. Female in her early 30s with a congenital osteocartilaginous hump. She was treated with 0.3cc Belotero Intense at the nasion, 0.1cc Intense at the supratip, 0.05cc at the nasal tip, 0.1cc at the columella and 0.2cc at the maxillary crest. The outcome is reduced appearance to the hump, together with an increase tip projection and the appearance of a slightly elevated tip. I use either EMLA or LMX 4 on skin cleaned with chlorhexidine. The patient should be sitting upright or semi-reclined. I prefer to inject from above the patient with the needle pointing towards the nasal tip as it is the easiest place to view the brow-tip aesthetic line. Injections can be performed using either needle or blunt cannula. Pinching loose skin between thumb and forefinger of my left hand, I hold the syringe in my right hand and inject into the midline with the needle entering slightly superior to the nasion at an angle, aimed towards the area of greatest volume deficiency. The needle is advanced until contact is made with the nasal bone. I inject a single depot injection of anywhere between 0.05 and 0.3cc, depending on the volume correction required. To prevent migration of the product during injection, it is important to inject slowly, and I also apply concurrent pressure laterally to the injection site with my left finger and thumb. After initial injection the product can be moulded and the nose re-assessed. 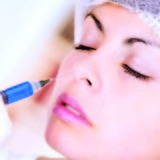 Further injections can be performed if the initial treatment is sub-optimal. Several techniques of supratip augmentation have been described. Injections can be performed via a needle directly through the skin at the point of deficiency, or via a cannula entering the skin from a distal point, either the nasion or the tip. I prefer to use a blunt cannula for augmentation of the supra tip for two reasons. Firstly, supratip depressions may require larger volumes of product to be injected, and having a distally-based injection point may potentially reduce the risk of implant infection. Secondly, as the supratip area is made-up entirely of soft tissues, a blunt cannula inserted distally into the correct plane is less likely to cause perforations through the various tissue planes, through which product can bleed. In the absence of a significant dorsal hump, I prefer to inject from the nasion down. I place my cannula in the superperiosteal or deep subcutaneous plane and slide the tip down to the defect. The tip of the cannula should be in the deep soft tissue in the midline, superior to the dorsal septal cartilage and superior medial to the upper laterals. It is important to note that inadvertent trauma to the upper lateral cartilages can have long-term implications in both nasal valve function and nasal cosmesis.Using the same technique as described for the nasion augmentation, namely, injecting small volumes slowly with pressure applied laterally to prevent product migration, the defect is filled.After injection, I withdraw the cannula and apply pressure to the tissues with a gauze swab soaked in saline. Pressure is kept on for at least three minutes as haematoma in this area can be catastrophic for the soft cartilage and result in cosmetic and functional deficit. The simplest nasal tip technique involves the placement of an implant vertically through the columellar. This single technique can provide subtle alteration to the shape of the tip through more than one mechanism. Firstly, provision of columellar support can reduce mild tip ptosis and lift the tip. Secondly, it can lengthen the appearance of a short columellar and increase tip projection. Thirdly, with a mild box-tip deformity, the soft tissue at the mid-portion of the nasal tip between the intermediate and superior parts of the two medial crura can be filled, which provides a more rounded and aesthetically pleasing appearance. The improvement occurs as a result of the primary filling of defect, but also due to the skin re-draping over an increased projection, which exerts a small medialising force on the splayed cartridges. This is also useful in the management of the bifid tip deformity caused by splayed intermediate crura. Finally, the effects of columellar lengthening and increased tip projection will pull the entire tip structure forward from the face. This results in a medial pull on the soft tissue of the lateral alar region, resulting in an apparent alar base reduction. In my practice, I use a topical anaesthetic cream to numb the skin after thorough cleansing with chlorhexidine. I identify the landmarks of the alar cartilage, specifically the domes, medial crura and the medial footplates. I make a preliminary stab incision through the skin of the nasal tip in the midline and then insert a blunt cannula directly downwards to the maxillary crest, taking great care to remain in the midline and avoid the cartilages. Injecting slowly, I carefully withdraw the cannula, leaving a ribbon of implant in the midline. Whilst injecting, I keep a thumb and forefinger on either side of the columellar skin and also the anterior vertical septal cartilage to prevent accidental bleeding of product. I observe for signs of blanching of the nasal tip that may indicate pressure on or transection of the columellar nasal artery. If volume is required in the nasal tip, a small depot can be placed superiorly on the column. Gentle pressure is applied for a minimum of three minutes. The techniques described allow correction of a wide range of nasal deformities without the cost, complications and downtime of surgery, providing an attractive alternative for patients. 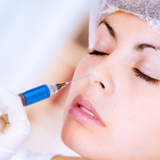 With appropriate experience of using injectable fillers, and a thorough appreciation of nasal anatomy, complications are unlikely. Dissatisfaction with cosmesis is easily addressed with the use of hyaluronidase. Injection rhinoplasty is a new technique that surgeons can utilise to compliment their practice and increase patient satisfaction. Koen JAO Ingles and Rene MJ Middelweerd, ‘Nasal Dorsal Management’, Facial Plastic and Reconstructive Surgery, ed. by Hade Vuyk (Florida: CRC Press, 2012), pp. 231-246.